From an old soldier, a friend; dedicated to all that have served. And to my church have you been true?" Because the streets were awfully rough"
But if you don’t I’ll understand"
You’ve done your time in Hell"
Remember, it is the Soldier, not the reporter Who has given us the freedom of the press. It is the Soldier, not the poet, who has given us the freedom of speech. It is the Soldier who salutes the flag, who serves beneath the flag, and whose coffin is draped by the flag, who allows the protester to burn the flag. One of my new heroes is Susan Konig, a former New York Post and current National Review columnist, author, and neighbor of my older brother. On top of all that, last week she gave birth to her 4th baby via her 4th (!) C-Section. Having been in the delivery room for the births of all my children (inlcuding one C-section) I feel qualified to say that she is remarkable for that alone. 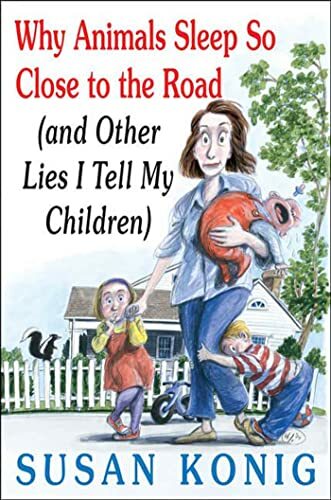 She recently published a book entitled Why Animals Sleep So Close to the Road (and Other Lies I Tell My Children), which earned her praise as the next Erma Bombeck. I am going to read it when I finish Freakonomics. Of course, I’ll actually buy hers. I have read much of her NRO work and she is terrific. Speaking of Freakonomics, a quick update. I have read the chapters on abortion and real estate and am formulating a more substantive rebuttal to his real estate theories. The one fly in the ointment is that the Chicago Real Estate Board has not responded to my emails, and I was hoping to have some of their data in my rebuttal. Even without their help, it will be a pleasure to show how wrong this guy is about his dubious real estate postulates.